They ‘ve got some creepy costumes, including a Children’s Dressing Up Set (£4.99) available in a witch, bat or scary skeleton design. 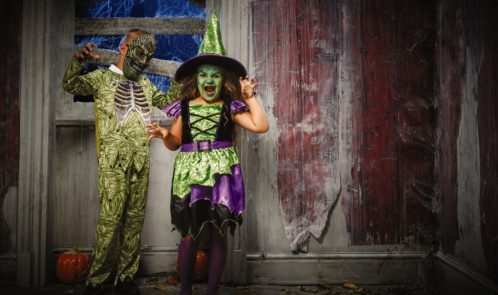 Adults can also join in the fun, with an Adults’ Halloween Costume, a devilishly good steal at just £7.99 making it easy to transform into a Witch, Vampire or Skeleton. The outfits don’t come for larger peeps, so if you’re an 18 women, you’ll have to wear something else but go big on the Spooky Face Paint Kit (£3.99). The Children’s Halloween Boppers Spectacles (£1.79) are for I’d say children younger than 8 as they didn’t fit my 12 year old, though we got him a flourescent skeleton top for £2.99. 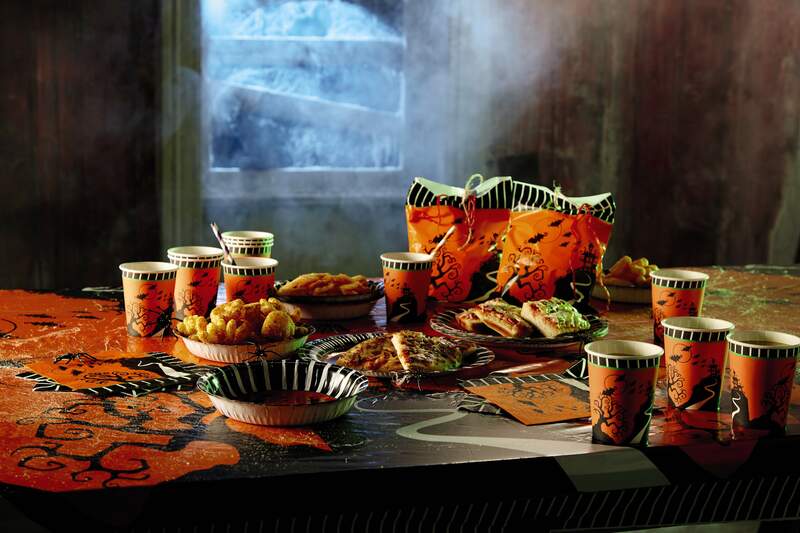 Once kitted out and suitably scary, Aldi’s Trick or Treat Tins (£1.79) and Halloween Treat Bag (£2.49) will keep sweet-collectors happy this year. A beautiful orange wreath on your door will be the envy of your neighbours for £3.99. 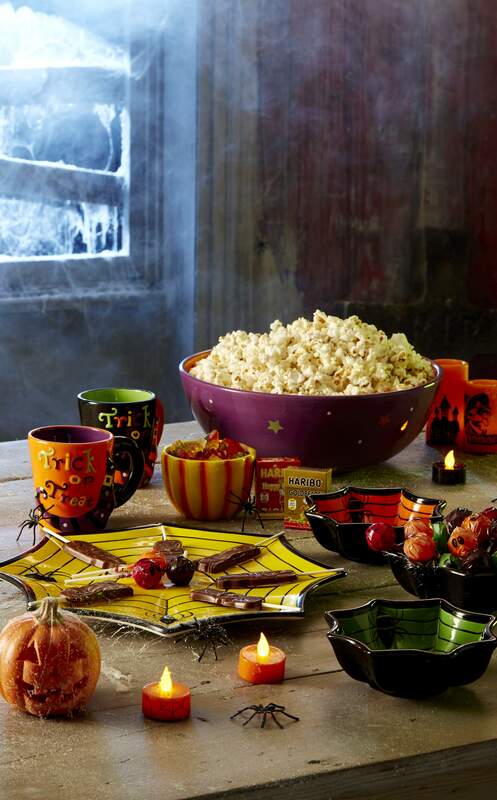 Now, if you are having a party, Aldi can help you spook it up for not a lot! 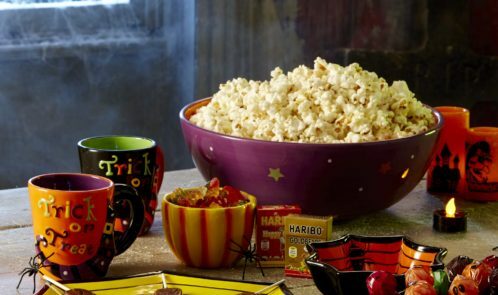 Transform cosy rooms into spooky spaces with Aldi’s Animated Decorations (£8.99) and Hanging Decorations (£3.99) including a rocker, prisoner or skeleton as well as Halloween Webs & Clings (£0.89). 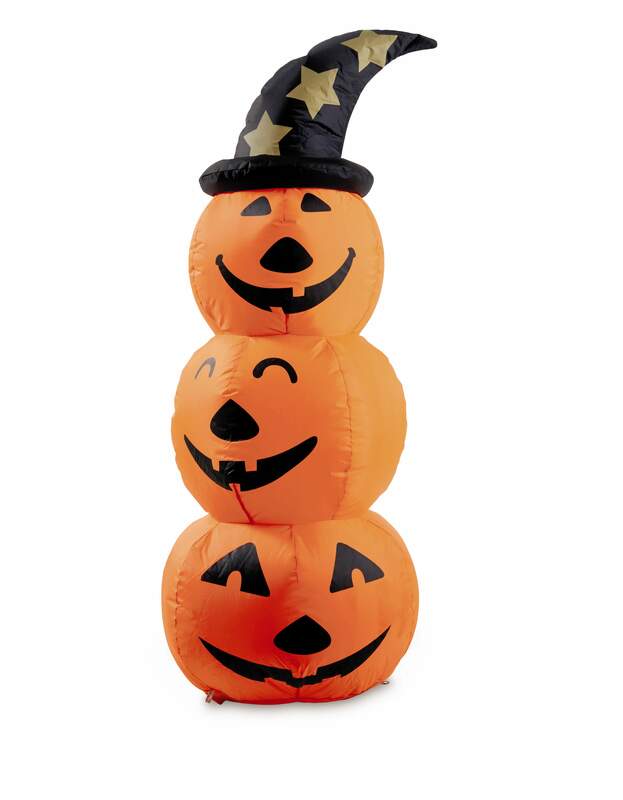 My favourite items are Halloween Inflatable Characters (£12.99), complete with LED lights will turn any house into a “terrifying” destination and are available in a Ghost, Dracula, Black Cat or Pumpkin design. If you are lucky, you should still be able to pick one up. Welcome trick or treaters with Musical Door Knockers & Skeletons (£7.99) which sing, light up and are sure to scare the wits out of any visitors – that is, if they’re brave enough to knock! 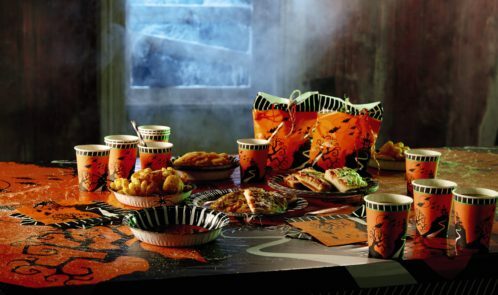 Don’t forget Halloween Ceramic Tableware (£6.99) and Drinkware (£2.99) – just the thing for devilishly delicious dinner parties. Aldi’s Assorted Partyware (£0.89) is a great-value selection of plates, napkins and table cloths, ensuring no mess when kids tuck into their fearsome favourites. The funniest bits are the eyeball icecubes. Disclosure…Aldi also sent me some things to look at, in addition to me buying my own.